If you’re working at a regular job, but have dreams of getting more from life, you may wonder…how will I ever find time to become an entrepreneur and leave the grind behind? How can I become an entrepreneur or freelancer, and follow my passions, if I don’t have time to make the transition? Here are the 3 best ways to find time to become an entrepreneur. You may wonder how some people are so massively productive…how do they make boatloads of money, put out several books per year, and also find time to golf regularly and take plenty of vacations? Some people are pulling this off, while you feel like you can barely keep up with your day job, your kids, and other responsibilities. Let’s start by asking some questions. When you think back on your life, what do you remember? What moments create the movie of your life? Do you remember surfing Facebook? Watching TV? Checking email? Probably not. You more likely remember outstanding personal interactions, emotional situations, and things you created. Thought of in this way, you create the life you live and remember by the day-to-day time decisions you make. I have this saying written down on a card next to my affirmations and love to review it regularly. It helps me make the best moment-by-moment decisions about my time. And it’s amazing what moment-by-moment decisions can do for your life as a whole. No matter who we are, we all share the same time limitations. So why do only some people lead such incredibly full, rich, healthy, and productive lives? Simple: they know how to make the highest-and-best use of their time. They use time to their advantage. I’ll give you three tips to turn on the switch for leading just such a life. And when you make the best use of your time, your remembered time—and therefore life—truly expands. Additionally, using these tips, I’ve come to realize I can get much more work done than most people, yet end up working fewer hours. In fact, right now, I have a wide variety of roles, many of which most people would consider full-time jobs. Yet I pull it off and maintain a balanced life. You never really know your behavior until you track it. People have off-base understandings of how their time is spent. In order to really nail this down, start by documenting how you spend your time for at least a couple of weeks. This means you’ll want to account for all 24 hours in a day. What sort of things should you track? Everything. The more detailed and honest you are with yourself, the better. Once you have this list, you’ll be able to go back and find time-freeing opportunities. You’ll also be able to quantify the waste you’ve removed. Doing this exercise is how I was able tell you, with certainty, that I saved 3 hours per day using #2 and #3 below. And 3 hours per day is a big deal…that was enough for me to get my own business started on the side while I transitioned out of my standard day job. If you want more detail on tracking your time and making the most of it, you can ready The Compound Effect by Darren Hardy or get my own Best Seller Leave the Grind Behind. Using your time productively does not always mean working. Perhaps having a picnic with the family will allow you to recharge and bond with your family. Whatever the use of your time though, being present allows you to realize the most from that time. By segmenting your time, you are more likely to make the best of it. The ability to sit down and work deeply on one item at a time. Try setting aside time for each of these throughout your days and weeks. Once you have these times set up, you can sub-segment that time, working on one individual work item at a time, for example. Put yourself into each of them 100% during their given time slot. I call this deep time. By focusing your time, you’ll feel as though you create time out of nowhere. Numerous studies have shown the tremendous “switching cost” you pay as your brain switches from task to task, concept to concept, or segment to segment. In fact, switching between activities rather than focusing on one at a time results in a 40% productivity loss, according to the American Psychological Association (Who Multi-Tasks and Why? Multi-Tasking Ability, Perceived Multi-Tasking Ability, Impulsivity, and Sensation Seeking by Sanbonmatsu DM, Strayer DL, Medeiros-Ward N, Watson JM). Multi-tasking doesn’t work, but you’re likely unaware of exactly how much it impacts your productivity until you deliberately segment and manage your time. The problem is, I don’t like to over-plan my day. Perhaps blocking off time and strictly adhering to your plan works for you. But I find I can’t stick to something this structured. Daily distractions and interruptions can blow my plans up quickly. Fortunately, I’ve found a great alternative. You spend 25 minutes focused on one task. Once the 25 minutes is up, you take a 5 minute break to do whatever you want. Then you do another 25 minute chunk of productive work on a specific task. You take a lot of breaks, but you will find yourself highly focused during those 25 minute intervals of deep work. For example, I may work email for 25 minutes. After a break, my next block is spent on writing an article. The trick is to truly focus on one item at a time. If you’re interested in The Pomodoro Technique, simply search for it and you’ll find apps for your computer or other devices that will manage the timing for you. It’s a very simple way to practice segmenting your time and focusing. Here’s one you can install on Chrome. This technique is no secret, but don’t let its simplicity fool you. Nothing will make you use your time better than writing—by hand—a list of things you need to do for the day. Each day, I start with a big blank sheet of paper with 16 lines. Before logging in to my computer, I write down what I want to accomplish that day. The goal is to know that if I complete the list, I will have felt productive for the day. I will have kicked the ball forward enough to drive the sort of momentum I need as a Grinder. “The very act of working from a list will increase your productivity by 25-50 percent the very first day.” -Brian Tracy, Get Smart! Getting into a list-making routine is particularly great when you feel stressed, overwhelmed, or disorganized. If you’re anxious or have trouble sleeping, keep a notepad handy and simply jot down ideas to tackle later. Then, relax. In the morning, you can review your notes and add items to your to-do list. There is a real mental advantage to taking a clear, focused moment to write out your day’s to-do list by hand. By physically writing the list, your mind engages on multiple levels. For more on this, check out the book Write it Down, Make it Happen by Anne Klauser, PhD. Or, if you don’t care about the background and supporting information, It Works is a lightning fast read and costs just a few bucks. What’s most shocking about making a handwritten list is that I usually finish the tasks on my list much faster than I expect, and I certainly accomplish more than if I hadn’t written a list. Think about that. I do more in less time. Often, I’m done by lunch. In other words, I write out a big, daunting list in the morning. I know if I accomplish those items, I’ll feel great about my productivity. I expect the list to take me a full day. Instead, I finish with half my day left. Awesome. Having accomplished my list, I can move on to other activities and time segments. I can move on to creative, big-picture items—precisely because my brain isn’t cluttered with outstanding things to do. Once you begin to see this in action, you’ll realize how much time you waste if you are unfocused. It’s absolutely incredible. And by the way, I am not an organized person by nature. Planning like this is actually difficult for me. If you’ve failed at more complex planning systems before, try the simple daily, handwritten list. The simplicity works wonders for me and ensures I get it done. I dive much more time discussing to-do lists in Leave the Grind Behind. Alright, you’ve seen how waste can add up to lost time. Be honest with yourself and identify at least 20 ways in which you are wasting time, then start making the cut. You’ll get some worksheets and many more hacks to save yourself time and money in my book Leave the Grind Behind. Are you better than your W-2 job? Make much more money, build a simple business, and quit your day job...without the complexity and without putting yourself at risk financially. 14 REAL Side Hustle and Small Business Ideas. 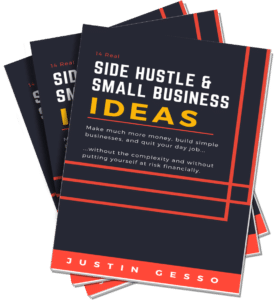 Get the free PDF guide and resources from bestselling author Justin Gesso. Make it happen this year. Get the bestsellers: Leave the Grind Behind and The Book on Small Business Ideas. 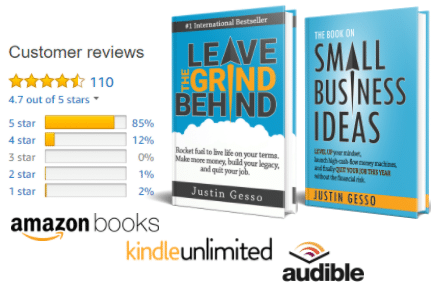 My name is Justin Gesso, author of the #1 International Bestselling Book "Leave the Grind Behind." Just about a decade ago I was in your shoes. I had an MBA and a good run in the corporate world, I was comfortable…but I wanted more. I wanted out of the grind. I wanted more time, more money, and more of a life on my terms. I’m the author of Leave the Grind Behind. It is the action-packed book with actions, habits, and tools that will enable your success and explode your results.